DESCRIPTION: Muscovy duck plumage is brownish-black with iridescent green and purple dorsal plumage and with white wing patches. They have red, fleshy protuberances on their faces. 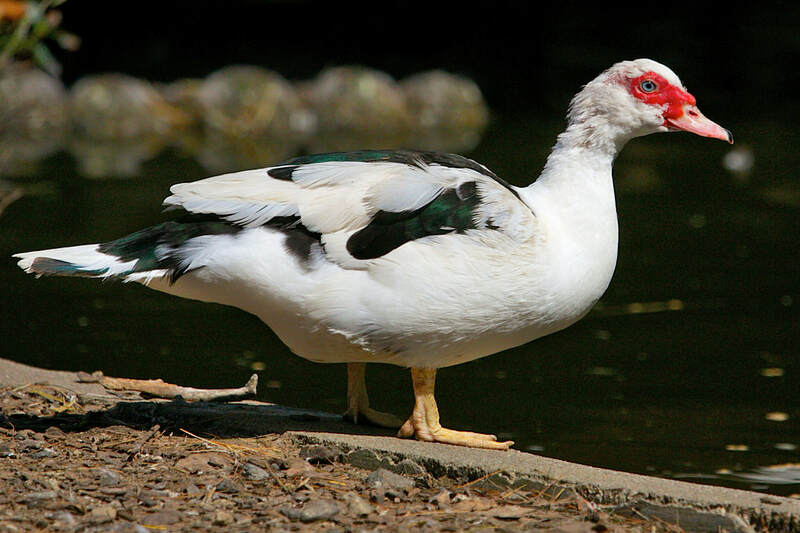 Domestic Muscovy ducks come in a wide variety of plumages, from white to buff, brown, chocolate, lilac and blue. They are large ducks, averaging 9 pounds. They measure 25 to 33 inches. Their wingspan can range from 53 to 59 inches. Male ducks are larger than females. RANGE: Native to Mexico, Central and South America. Wild populations live in the lower Rio Grande & part of Texas. They have also been domesticated and adapt well to colder climates. HABITAT: Prefer to live in forest areas near water. Ducks will roost in trees at night and create nests in tree cavities. DIET: Omnivorous – they eat roots, stems, leaves and seeds of aquatic and terrestrial plants. Also feed on small fish, reptiles, crustaceans, insects, millipedes and termites. 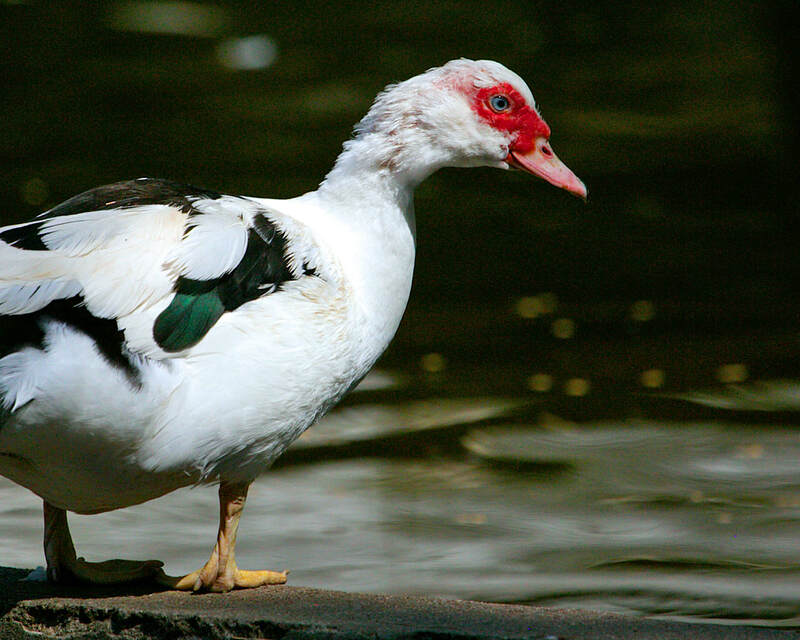 FAMILY LIFE: Muscovy ducks breed from the beginning of August to May. During breeding season, male ducks attract females by wagging their tails and showing off their crests. Females build nests high in hollow trees constructed of twigs, stems and mud. They lay an average of 8-10 eggs. 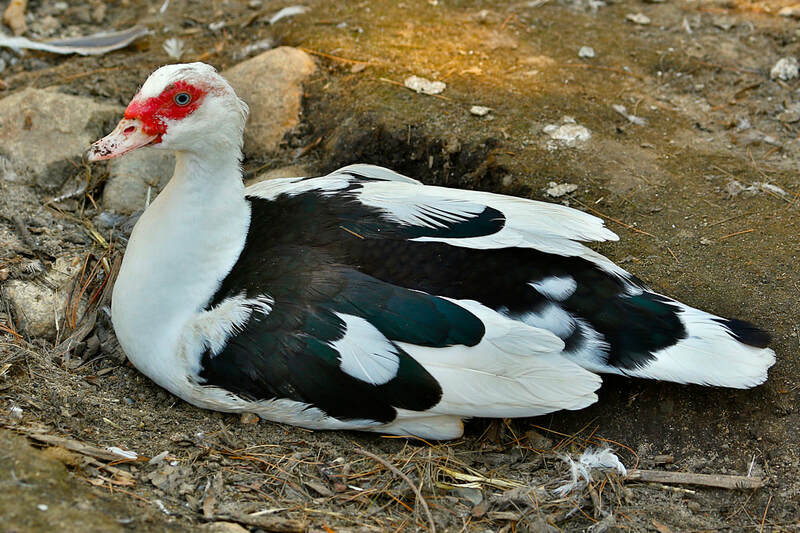 Muscovy ducks can breed 2 to 3 times per year, and incubate their eggs for 33 to 35 days. Females protect nestlings for 60 to 70 days, until the young are independent. LIFE SPAN: Typically 7-8 years; up to 9 in human care.